This is exactly what I was looking for to use with my 'good' Oneida set and my everyday Oneida set. Not too fussy, good weight and balance, and easy to clean. I'm getting a set of these for my Dad for Father's Day. Entertain dinner guests using this elegant stainless steel steak knife set by Oneida. These serrated knives feature a stream-lined design and slice through steak, poultry, and other meats with ease. Dimensions 16 x 12 x 2"
These are very good steak knives. The very sharp serrated blades make cutting meats a very easy task. They match my stainless steel flatware very well. We received Gerber steak knives for a wedding gify, they have to be sharpened professionally, these knives are sharp and have a serrated edge, we love them !!! Great, solid knives for a good price. I was looking for steak knives that could go in the dishwasher. So far so good! There was an issue with shipping, but Overstock resolved it quickly once I notified them the item had not arrived yet. These steak knives do a great job. Very sharp. Very nice set. Worth the price. I wouldn't pay more than I did here on overstock. They seems to be pretty sharp and being serrated they should hold up for a while. I have had these knives for quite a while and I am a big fan. I love the look of them and they have stayed looking great with no corrosion or discoloring. THESE ARE THE BEST KNIVES IVE EVER HAD! REALLY ELEGANT AND EXTREMELY SHARP! Not used yet but appear to be good quality. Nice weight , satin nickel finish is a little dark but still a nice product. "what is the length of the knife from tip to end of handle?" J.A. 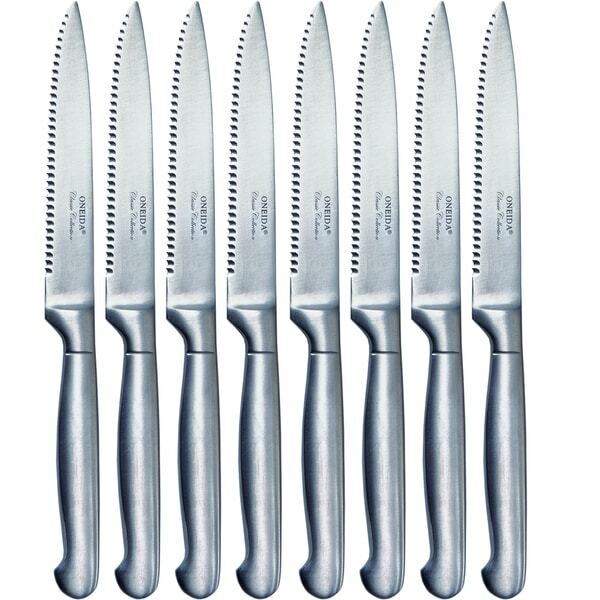 Henckels International 8-pc Serrated Steak Knife Set - 4.5"